Two recent additions to our orchid collection are miniatures with blue hued foliage, which makes them irresistible as far as I'm concerned. Our Promenaea riograndensis is small enough to fit in the palm of my hand. 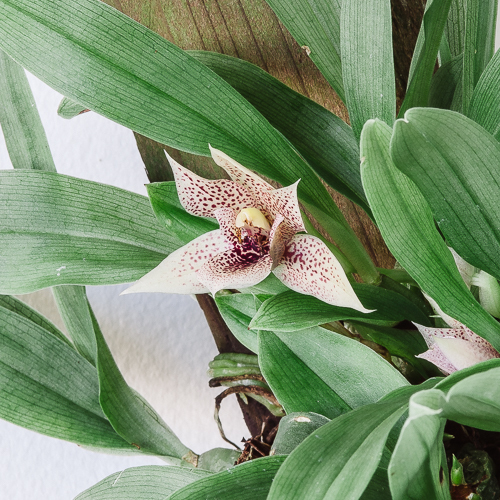 It is a native of the cool humid mountain regions in Rio Grande Do Sul and Santa Catarina state in southern Brazil where it grows as an epiphyte, sometimes in association with P. stapeliodes, according to Jim & Barbara McQueen in Orchids of Brazil. The leaves are thin and pliable like many of the other moisture loving species in the subtribe Zygopetalinae. Since I don't have an elevation range for this species, I'm going to try growing it first in an intermediate greenhouse. If it looks stressed in summer I'll move it to the High Elevation House. The promenaeas are a fantastic group, well worth growing if you have the opportunity. 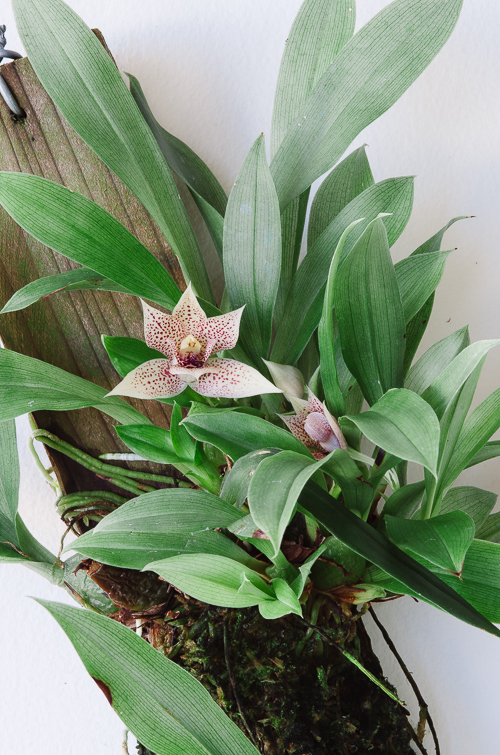 And then there's Dendrobium trantuanii, which has some of the most beautiful pseudobulbs I've seen. They are laterally flattened and a striking blue grey color. Even the stem sheaths are gorgeous. Denderobium trantuanii was described in 2003. 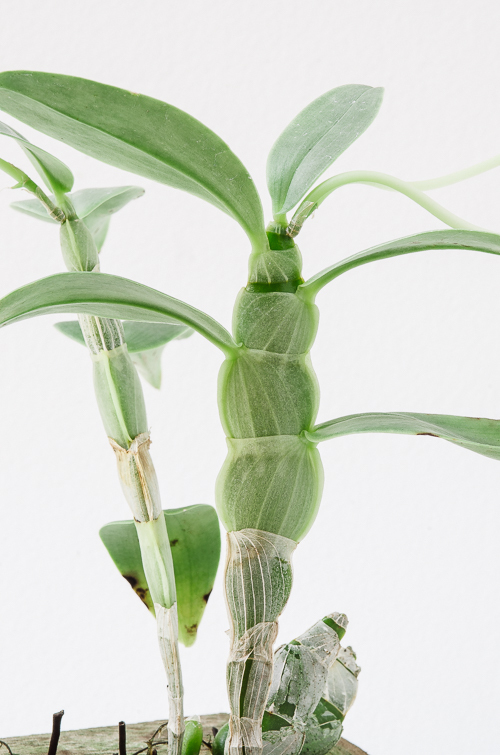 It grows as an epiphyte in seasonally dry evergreen forests of northwestern Vietnam at 800 to 1,000 meters elevation. Our plants are growing in our warm greenhouse. In our greenhouse, they seem to prefer growing in small cedar baskets with a small amount of moss and chopped tree fern, rather than on a cork mount. 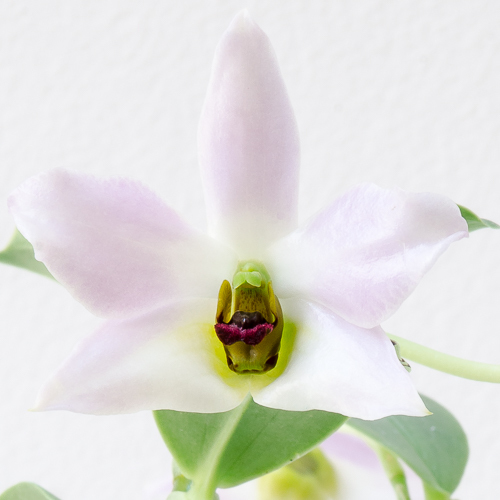 The flowers are about two centimeters across, waxy and glossy with a faint rosy blush. I'm looking forward to growing seedlings of these beauties produced in our lab. I'm glad you like them! I hope all is well with you and your research. Thank you for your comment!